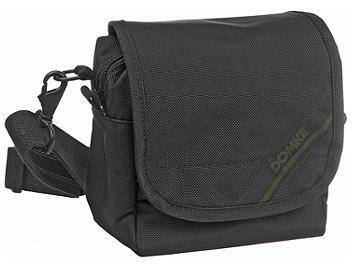 The Domke J-5XA Shoulder and Belt Bag, Small (Black) is a water-resistant 1050 ballistic nylon camera bag designed to carry cameras, lenses, cell phone, MP3 player and accessories. The case has canvas panels on the rear of the bag to protect clothes from abrasion and a 200 denier pack cloth interior lining. There is a main compartment that can be divided into 2 compartments. There are 2 front pockets. One padded divider wall is included to customize the bag. The bag is carried by a removable, adjustable non-slip Gripper shoulder strap.